Following Benedict XVI’s groundbreaking resignation, the archbishop of Buenos Aires was elected the 266th pontiff of the Roman Catholic Church and immediately began to put his mark on the office. Francis appears on the balcony of Saint Peter’s Basilica for the first time as pope. 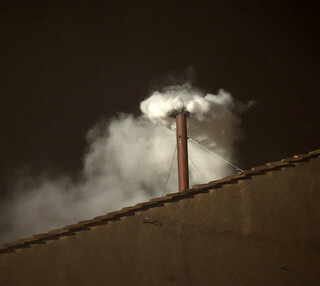 The white smoke rising from a chimney over the Sistine Chapel in the Vatican at 19.06 Rome time on 13 March indicated to the thousands gathered in Saint Peter’s Square that the papal conclave had chosen a new pope. Francis immediately began to set the tone for his papacy, one of humility and simplicity, and less formality than those of his predecessors on the throne of Saint Peter. Indeed, he shunned the papal throne while accepting the conclave cardinals’ congratulations following his election, receiving them while standing. He endeared himself to Catholics and nonbelievers alike when, after his election, he took the bus back to the Domus Sanctæ Marthæ (Saint Martha’s House)—the Vatican guest house, where the cardinals stayed during the conclave—with the other cardinals, rather than being driven in the papal car. At the guest house he insisted on paying the bill for his room. He has now chosen to live in the Domus Sanctæ Marthæ, rather than the official papal residence in the Apostolic Palace. His ministry throughout his life has been marked by humility and a commitment to serving the poor. Francis, elected pope at age 76, was born 17 December 1936 in Buenos Aires. Though Francis is considered the first non-European pope since Gregory III, who reigned from 731 to 741, his father was an Italian immigrant while his mother was born in Argentina of Italian parents. Prior to his selection as the 266th pontiff of the Roman Catholic Church, he served as archbishop of Buenos Aires. He was named a cardinal on 21 February 2001 by John Paul II. As an Argentinian, he speaks Spanish natively, but he is also conversant in Latin, Italian, German, French, Portuguese, English, Ukrainian, and Piedmontese. Francis’s predecessor, Benedict XVI, surprised the world when on 11 February he announced his resignation, effective 28 February. Prior to his election as pontiff, Benedict had served as prefect of the Sacred Congregation for the Doctrine of the Faith, which defends—and shapes—Catholic doctrine. The question of whether a pope could resign his office had swirled around the Catholic Church for several years, particularly toward the end of the papacy of Benedict’s predecessor, John Paul II, whose declining health caused many to wonder whether he could continue to fulfill his demanding duties. When his own health began to deteriorate, Benedict chose to affirm by example that, yes, a pope can resign. He is now the pope emeritus. After his election, many news outlets referred to the new pope as Francis I. 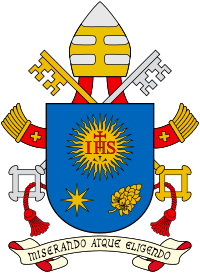 But Vatican spokesman Federico Lombardi clarified that the new pontiff would be called simply Pope Francis: “It will become Francis I after we have a Francis II,” he said. The First Presidency offered this statement following Francis’s election. Portions of text were adapted from the Wikipedia article on Pope Francis, CC BY-SA 3.0. This article appeared on pages 14–15 of Issue 10 | April 2013.